Tour the Forge - Village Blacksmith, Inc. 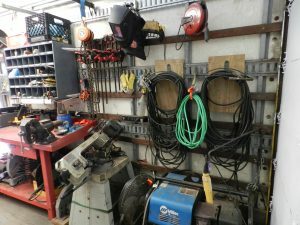 I admit I have collected more tools than I need: It's a disease, plain and simple. 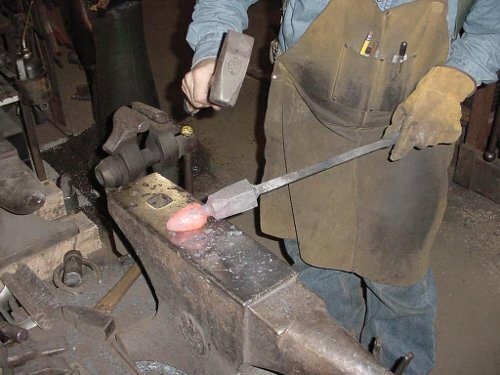 Believe it or not, Ken is forging a steel egg. Yes, you read that right. An egg. Made of steel. 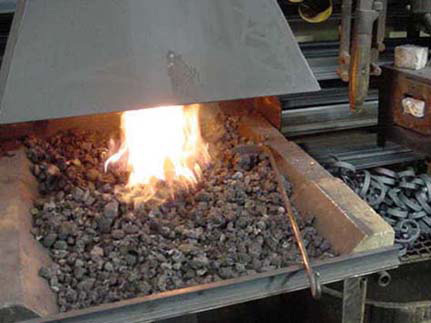 Anything is possible if the steel is hot enough, and the blacksmith is good enough. 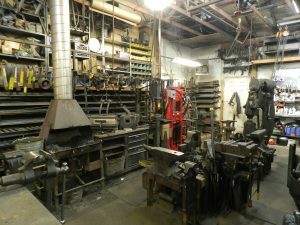 Forging operations are carried out with both coal and gas forges; multiple anvils; a large collection of blacksmiths hand tools, hammers, tongs, vises and swage blocks; and five (count ’em five) restored Little Giant power hammers dating from the early 1900’s. 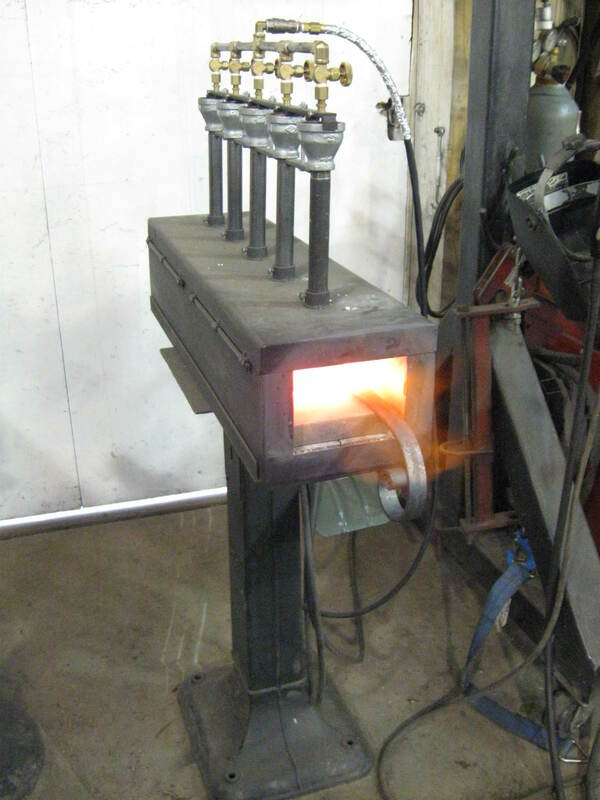 Each power hammer has a different set of dies and we often use three or four hammers simultaneously. 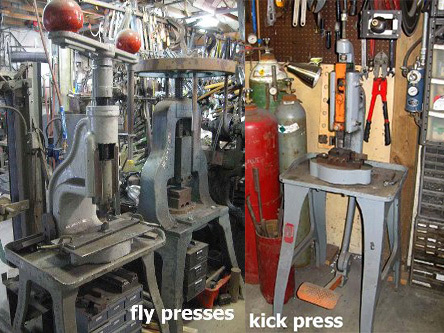 We have two large fly presses as well as hydraulic presses and a treadle hammer in the forging area. 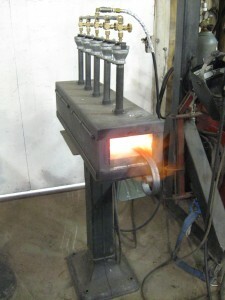 A kick press is used for making collars. Two of the five power hammers. The “camel back” is quite rare, used to manufacture caskets back in the day. 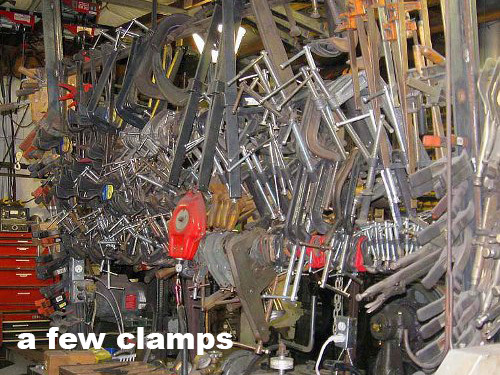 A blacksmith is only worth their weight in C-clamps. A variety of Mig welders, Tig welders, spot welders, stud welders and gas welders are used in welding operations. 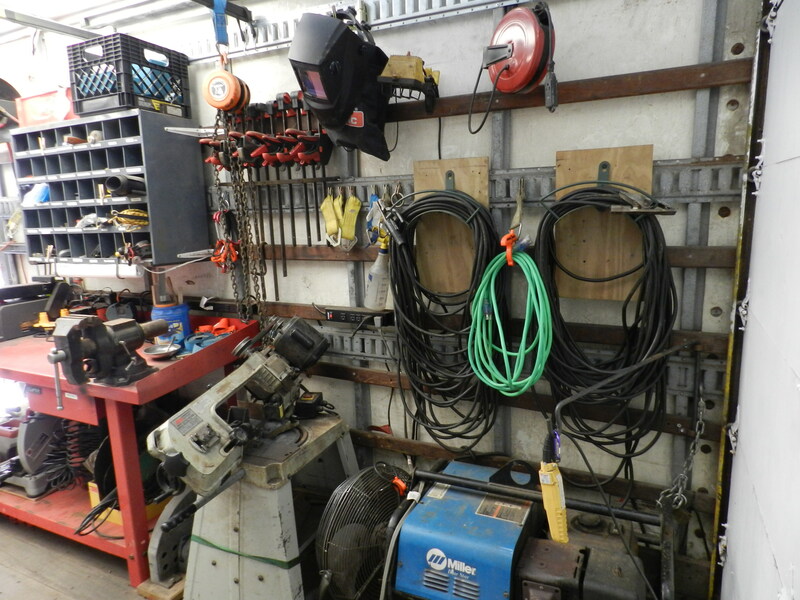 Cold saws, band saws and a variety of shears and cutters are used for cutting material. 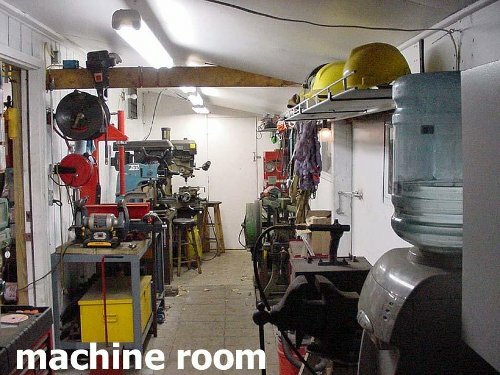 A machine room is set up with milling, drilling, tapping and turning machinery. 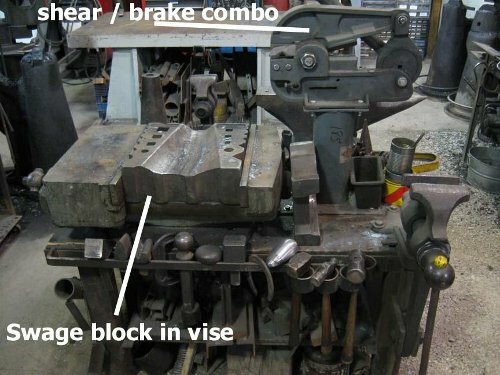 Hydraulic ironworkers and mechanical punches do most of our hole punching. Powered and manual rolling machines are used to roll curves into steel bars. 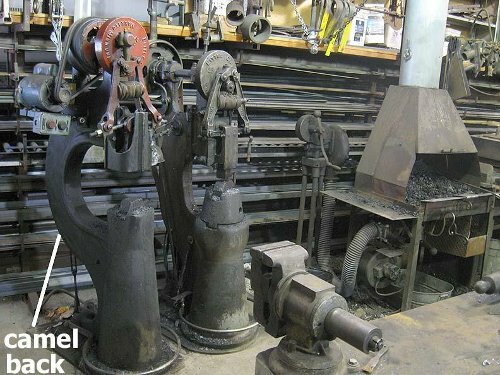 There are also machines for twisting, bending, notching, grinding, and shaping. 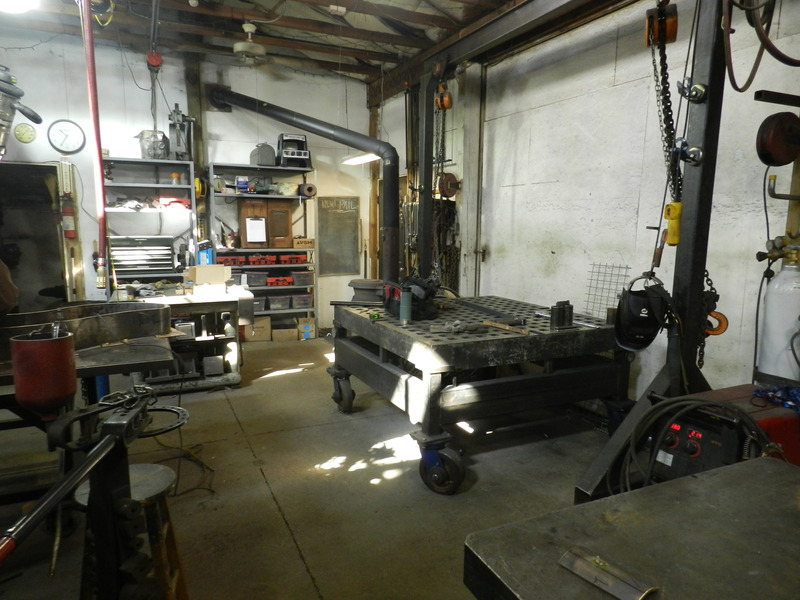 In addition to the blacksmith shop and machine shop, a second building houses complete woodworking, sheet metal and maintenance facilities as well as vehicles. The back half of our old house houses our conference/meeting room, office and my personal “Museum”: a collection of antique woodwright and blacksmith tools. 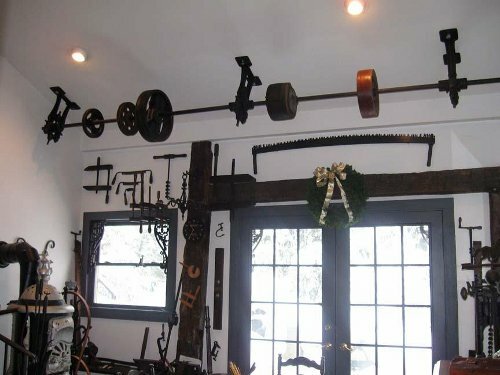 The infamous “hammer wall” is an entire wall displaying old hammers. 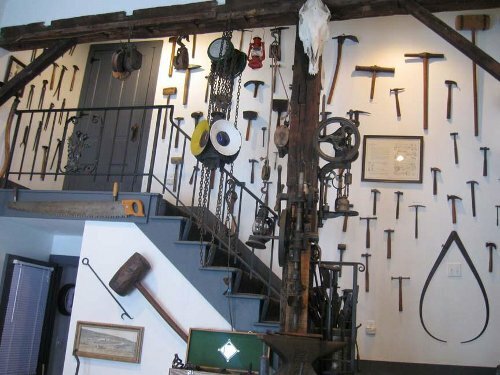 Collections of wrenches and other unusual tools, as well as my old horseshoeing tools, are also on display. But who dusts all those hammers? 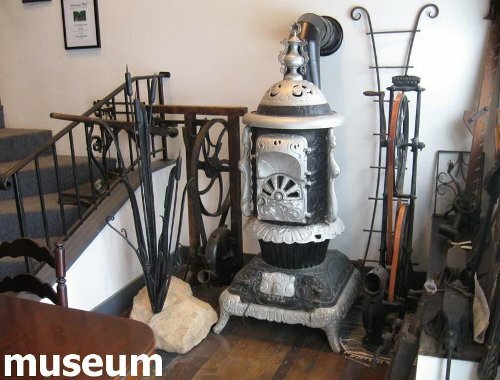 Okay, so it’s not technically a working stove, but when we put a little electric heater inside, it sure does make the conference room nice and toasty-warm. An authentic line shaft with antique pulleys. In my next life I am going into Origami, but in this life everything is heavy: a forklift, Bobcat skid steer, Kubota tractor, and a collection of lifts, cranes, hoists, and material handling equipment make this a little more palatable. 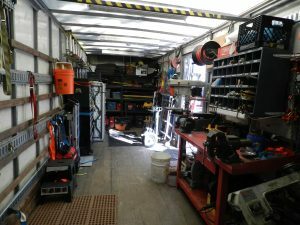 For installations, an 18,000-pound box truck is outfitted as a complete rolling workshop and delivery vehicle, complimented by a Ford van and three trailers. 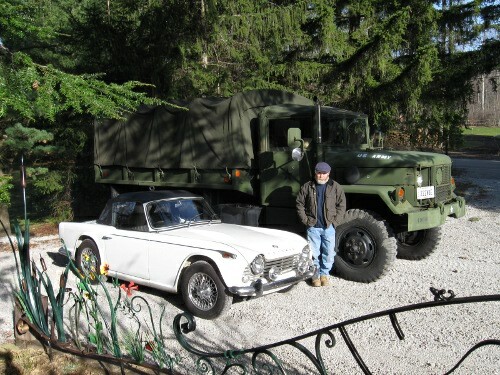 For those really heavy or off-road loads we use “Bertha”: my 1968 US ARMY M35 Deuce and a Half (affectionately known as the “Hummer Crusher”) still carrying her drab green and stars. On the opposite end of the size and weight spectrum, my 1967 Triumph TR-4 roadster is my favorite for appointments on nice summer days. © 2019 Village Blacksmith, Inc.